Zoo animals receive regenerative cells (stem cells) isolated from their own fat to relieve them of their ongoing pain. InGeneron Incorporated and Gulf Coast Veterinary Surgery (GCVS) teamed up with The Houston Zoo to help two of the zoo’s popular cats on June 20, 2012. Pandu, a 286-pound Malayan tiger, and Ivy, a 68-pound black leopard, suffer from arthritic pain. Zoo veterinarians Dr. Lauren Howard and Dr. Maud Marin have extensive experience with surgical procedures on the zoo’s animals, but these were unusually complicated cases. Therefore, the Houston Zoo called Dr. Brian Beale of Gulf Coast Veterinary Surgery to provide surgical expertise, and InGeneron Incorporated to provide the latest products enabling autologous stem cell therapy for osteoarthritis. Dr. Beale and Dr. Howard harvested a small amount of fat tissue from the abdomen of each of the animals and then processed using InGeneron’s ARC™ System to isolate the stem cells. While the tissue from each animal was being processed, Dr. Beale performed arthroscopic surgery of the damaged elbow on each animal to evaluate and treat the cause of the arthritis. Arthroscopy is a minimally-invasive surgical technique that allows increased surgical precision and rapid patient recovery. Dr. Carl Friddle of InGeneron Incorporated said, "Once the fat was removed, we cut it into small pieces before processing. This helps our proprietary enzyme mix gently remove the cells from the fat tissue." With InGeneron’s ARC™ System the veterinarian can rapidly isolate and concentrate the abundance of regenerative cells found in adipose (fat) tissue so that they can be administered in a single procedure without the need to grow the cells for several weeks. This enables veterinarians to use regenerative cell therapy in their clinics, or at remote locations, to treat orthopedic injuries, degenerative conditions and non-healing wounds in companion and performance animals. “With our process, we yield a high percentage of live regenerative cells, and systematic studies have shown these adipose-derived regenerative cells secrete growth factors that induce healing and formation of new blood vessels, elicit potent anti-inflammatory effects and have the great potential to engraft and differentiate into specialized cells to restore function to the tissue where they are administered,” said Dr. Michael Coleman, President and Chief Scientific Officer of InGeneron Incorporated. Veterinarians are hopeful that the new cell therapy will shorten the healing time and provide a better, longer lasting result. Dr. Beale showed the degeneration in Pandu's elbow to the treatment collaborators on the operating room video monitor. In some areas of the damaged joint, there was bone on bone contact, and bone fragments had broken loose. "This is by far the largest fragment I've ever seen with this condition," said Dr. Beale, who often performs this same procedure on house cats and dogs. Ivy had similar changes to Pandu but in both elbows. Thanks to InGeneron’s rapid method for cell isolation, Pandu and Ivy both had their own regenerative cells ready for injection by the end of their surgeries. Dr. Beale injected the cells into the affected elbow in only a couple of minutes, and both cats were taken back to familiar surroundings for rest and recuperation. Neither animal showed any complications from the surgery and within a week both were back on exhibit. 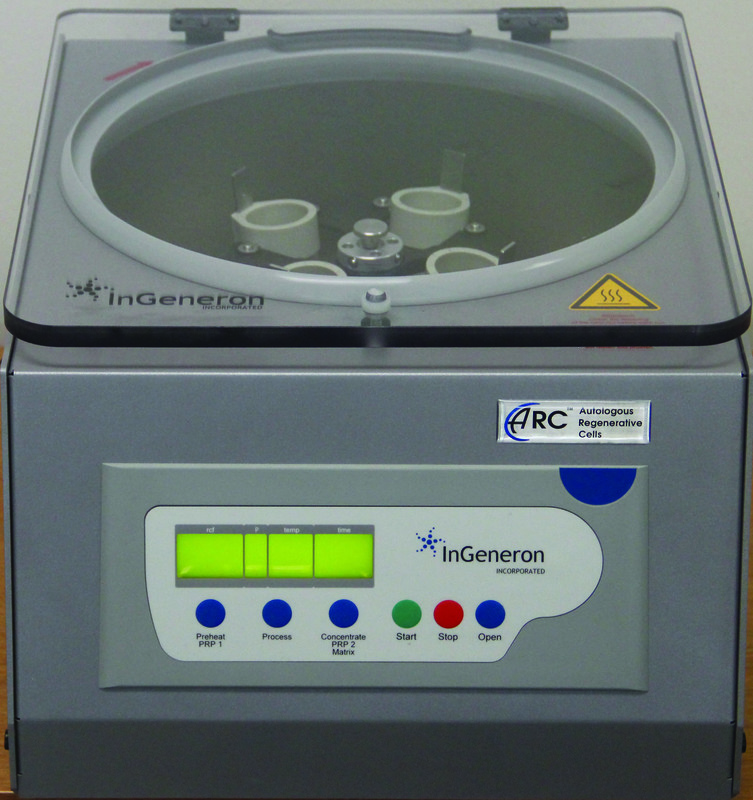 Veterinarians in the USA, Canada, Europe, and Mexico are currently using InGeneron’s ARC™ System. Last year, InGeneron collaborated with Dr. Francisco Cortes Van Aarem in Mexico to provide regenerative cell therapy to Tibetana, a rescued Bengal tiger, with serious injuries to her back. Today, Tibetana is doing well at the Zacango Zoo. A wide range of injured animals, including household pets and performance animals, may benefit from this innovative type of procedure. InGeneron Incorporated offers a portfolio of products for the preparation, characterization, and administration of a patient’s own adipose-derived regenerative cells. The product line focuses on point-of-use, providing for preparation and administration of cells within a single procedure, in the clinic or out in the field. Preparing Pandu for SurgeryThe Houston Zoo prepares Pandu, a Malayan tiger, for arthroscopic surgery and regenerative stem cell therapy. Ivy Awaits SurgeryIvy, a black leopard, waits her turn for arthroscopic surgery and regenerative stem cell therapy. Collecting a Fat Sample for Regenerative Cell TherapyDr. Beale obtains a small sample of adipose tissue that will be processed using the InGeneron ARC™ System to obtain regenerative stem cells. Autologous Regenerative Stem Cells Prepared by InGeneron IncorporatedAutologous adipose-derived regenerative stem cells are prepared at point-of-use using the InGeneron ARC™ System. Ivy Receives Injection of Her Own Regenerative Stem CellsIvy, a black leopard, receives an injection of autologous adipose-derived regenerative stem cells prepared using the InGeneron ARC™ System. Pandu On ExhibitPandu, the Malayan tiger, is back on exhibit after receiving autologous regenerative stem cell therapy prepared using the InGeneron ARC™ System. Ivy On ExhibitIvy, the black Leopard, is back on exhibit after receiving autologous regenerative stem cell therapy prepared using the InGeneron ARC™ System. InGeneron ARC™ SystemThe InGeneron ARC™ System enables the preparation of autologous adipose-derived regenerative stem cells at point-of-use within 90 minutes.